In the wake of the pageantry surrounding U.S. President Donald Trump’s historic summit with North Korean leader Kim Jong Un, questions over the substance of a vaguely written denuclearization deal lingered as some experts and former officials anticipated how the White House might beef up the bare-bones agreement. “Even ‘denuclearization’ is put in terms of ‘working towards’ this goal,” he wrote. According to Pak, who worked as a Korea analyst at the CIA until last year, Trump could have used the summit as an opportunity to reinforce Washington’s commitment to its alliances with South Korea and Japan, “but instead made gratuitous comments complimenting Kim and touting his trustworthiness, as well as raising the possibility for more giveaways” to the North Korean dictator. Tokyo and Seoul, already nervous after a year that saw Trump and Kim push the Korean Peninsula to the brink of war, have grown accustomed to the U.S. president’s erratic behavior, but remain wary that he could in an instant make alliance-altering decisions without their consultation. Indeed, Trump appeared to highlight these fears Tuesday with a seemingly out-of-the-blue decision to halt joint military exercises with South Korea. That surprise announcement caught not only Seoul and Tokyo off guard, but also the U.S. military in South Korea. For Japan, Philip Yun, a North Korea expert and executive director at the Ploughshares Fund in San Francisco, said Trump’s follow-through on a pre-summit promise to raise the issue of Japanese nationals abducted by North Korean agents in the 1970s and 1980s “was easy for the president.” But Yun noted that since it was not mentioned in the statement, it was not clear how much energy had been devoted to any discussion. As for shorter-range missiles capable of striking Japan — a top concern of Tokyo’s that appeared conspicuously absent from the summit discussions — Yun said that the issue “may have been too much to discuss for now,” but added that it would need to be addressed in any subsequent talks. Kim announced in May that the North would halt launches of intercontinental ballistic missiles (ICBMs), a decision that left open the possibility of tests of short- and intermediate-range weapons, including the hundreds of Rodong missiles it is believed to possess. 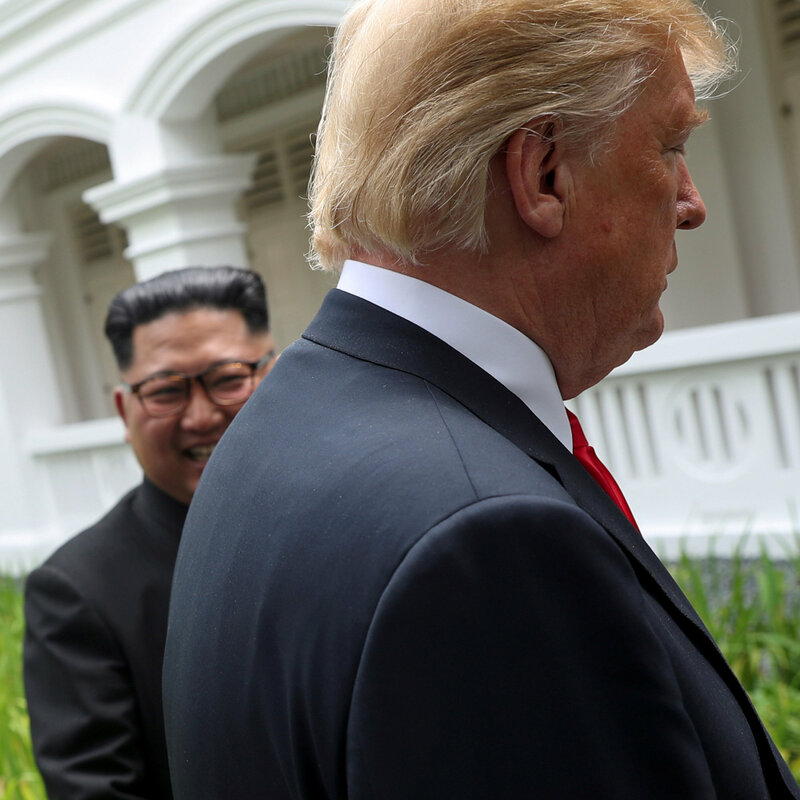 “The summit restarted long-defunct diplomacy and dramatically showed the two leaders are vested in its success,” said McEachern, who is also a former analyst on North Korea with the U.S. State Department. Typically, summits such as the Kim-Trump meeting, as well as detailed goals, are hashed out by lower-level officials and experts. Trump turned this approach on its head by starting from the top. But while some commentators praised the return to somewhat solid diplomatic footing and away from the threat of nuclear war, others cautioned that Trump’s meeting with Kim and the growing detente between the two nations was a win-win situation for the North Korean leader. They said Kim had gained what he had long craved: recognition of the North on the global stage as a de facto nuclear power and normal state, while at the same time leaving him with an escape route if things went sour on the diplomatic front. Indeed, concerns over apparent concessions by Trump at the summit emerged Wednesday as North Korea said that the U.S. president had explicitly acceded to two of Kim’s most sought after goals during the talks. Despite this, the Ploughshares Fund’s Yun, who was part of the U.S. delegation that traveled to the North with then-Secretary of State Madeline Albright for a landmark visit to Pyongyang in October 2000, said that while he agreed that the results of the summit were “unclear and lacking in detail,” Tuesday’s meeting was part of an ongoing process. “I am willing to hold judgment for now; but we must have a clear sense of what North Korea means by denuclearization — both to timing and scope. This in the end is how we judge this process,” Yun said.